Kinesis believes it is the first telematics supplier to take advantage of voice assistance technology. The voice app works for any vehicle fitted with Kinesis trackers and is accessed using the Amazon smart speakers such as the Echo and Dot, as well as the Alexa smartphone app. It allows companies to assess the performance of their employees. By utilizing voice technology, the Kinesis Alexa app adds another dimension to safety allowing hands free access to information while on the move, making journeys more productive for those in charge of operations. The Kinesis development compliments the recently announced Alexa for Business which brings voice controls into the office as part of a fully managed service for multiple Alexa devices in the workplace. Artificial intelligence is revolutionizing industries that depend upon telematics and will compliment Kinesis road safety technologies with their enhanced system that monitors drivers and their driving performance. The Kinesis Alexa app using voice technology adds another safety feature by allowing hands-free access to vital information while driving. No longer do drivers need to refer to a computer screen to get important data. 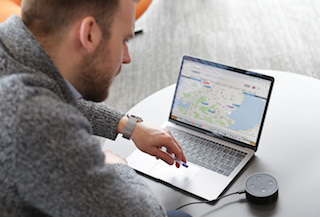 Adam Partington, marketing manager for Kinesis, spoke with GISCafe Voice about the new Alexa addition to their vehicle tracking technology. Who is the Alexa service being offered to currently? It is a new service being offered to organizations who use the Kinesis GPS vehicle tracking system – about 100,000 vehicles are being tracked using the system, mainly in Europe but also in the US and South East Asia. Managers are using Alexa to locate their sales and service staff and find out more about performance metrics. What is the Geospatial component to this technology? I can see where there is some location mapping going on. Vehicles are fitted with GPS and communications so fleet controllers can view vehicle locations and movements on maps, for managing mobile operations. Customer locations are added (depots, delivery points and maintenance service locations for example) with geofencing to set up auto-alerts for delivery/arrival time notifications, divergence from route, restricted zones etc. How facile is Alexa at identifying the location of a given individual or car? It’s as precise as the data received from the vehicle, so ‘Heading west on Route 66, 5 miles east of Flagstaff’ or ‘Located at AutoPark, Tucson International Airport’. Normally the vehicle will have an ID reader installed to identify the driver on entry to the vehicle. What is added to Alexa to make this identification possible? Do you need a certain caliber of speakers and devices for this use in a commercial setting? If so, what are the requirements? Currently just an Amazon smart speaker device, or app on a smartphone. Can you give a use case example of where this would be a valuable technology to employ in a business? It is really designed for business giving customer services, fleet controllers and managers quick answers to questions. Instant access to key information without having to do a search on a computer or smartphone. One simple voice query like ‘where is Joe Bloggs’, for example, will give a quick audible answer. When managers are on calls or in meetings Alexa can answer questions without having to work through menus to find the information (by manual intervention). How does this product streamline the use of data? It provides specific answers to questions in the simplest way possible, which is very typical of our solutions. We’re all about streamlining data and making fleet management easier for our customers. This entry was posted on Thursday, March 28th, 2019 at 9:31 am. You can follow any responses to this entry through the RSS 2.0 feed. You can leave a response, or trackback from your own site.